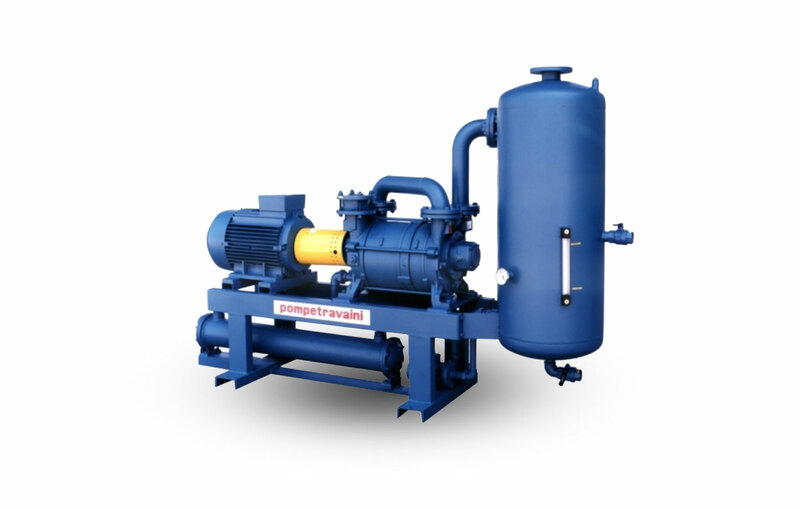 The units of HYDROSYS series consist of a liquid-ring vacuum pump of our series TRH, TRS, TRM, TRV, of an air-liquid cyclone separator, of a heat exchanger, all units being mounted on one compact frame. During the operation, the vacuum pump ejects the sucked gas from the delivery port and also part of the service liquid which is present inside it and which must be continuously made up. The air-liquid mixture is delivered to a cylindric tank where the separation occurs: the gas comes out from the upper delivery port of the tank, ready to be sent again to the vacuum pump. 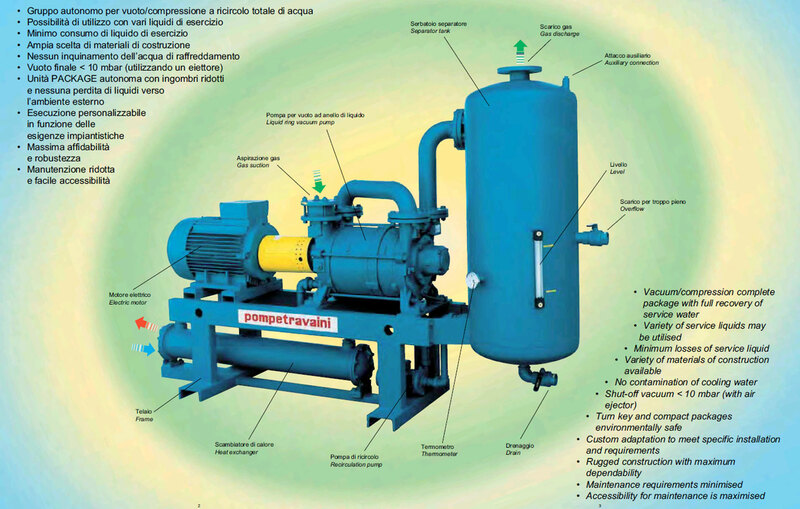 During the suction and compression cycle, the vacuum pump transfer all the work carried out under the form of heat to the service liquid, which, of course, before being recycled, shall be cooled down either by means of a heat exchanger (total circuit) or by the supply of fresh liquid from outside (partial circuit). of the vacuum pump (please remember that the hotter the operation liquid is, the more loss of suction capacity the pump suffers both in flowrate and in maximum vacuum degree: see the technical information given in our catalogue for vacuum pumps). This system is particularly suitable, when the service liquid or the condensable sucked gases cannot be eliminated outside due to reasons of pollution or to recuperation requirements and cost reasons (see our diagram on page 6). The PARTIAL RECIRCULATION operation, instead requires a constant supply of fresh liquid from outside, that is of the same kind as the one circulating inside the unit, since the mixing of the external fresh liquid with the one that is inside the unit keeps the constant temperature of the fresh liquid at the vacuum pump inlet. According to the amount of liquid supplied from outside, the same amount will be eliminated through the discharge located on the center line of the tank. 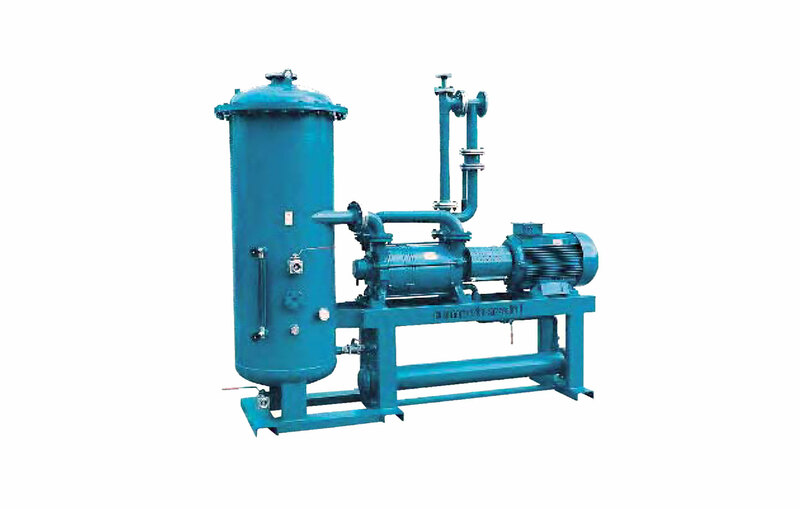 This type of operation is sometimes advantageous if this is required by the flowrate and vacuum characteristics, (for example low vacuum or intermittent operation) or when the service liquid is not polluted and does not create elimination problems. Of course, since a cooling liquid with correct amount and temperature is not available, this remains the only alternative to the total circuit. Several accessories are available to meet particular requirements of plant, of process and of maintenance, and furthermore, it is possible to design particular units, upon request, in co-operation with our Sales Office. The HYDROSYS series can also be used to work as a compressor up to a maximum pressure of 2 bar, higher than the suction pressure by using tanks and accessories according to ISPESL standards.